We have already told you about printed sweaters for fall days, so today it’s time for so popular and common polka dot ones. They look absolutely amazing and cozy with various skirts, jeans and culottes. So first of all, choose a type of your new sweater (loose, cropped, V-neck, turtleneck, fitted and others), and then consider various color combinations from black and white to teal and white or pale pink and black ones. For more ideas you can scroll down. Enjoy! Many fashionistas combine such sweaters with skinny pants, so you can follow their examples too. 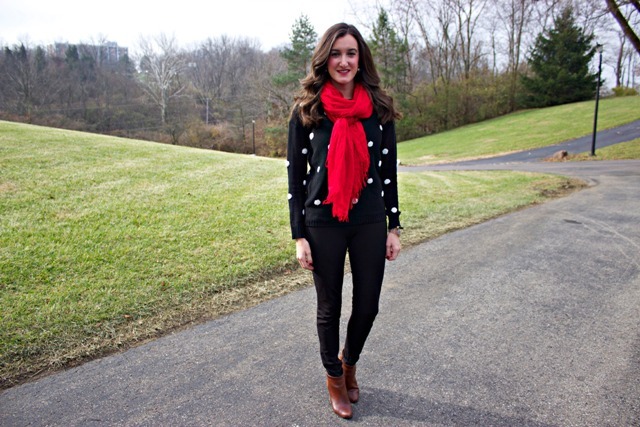 For example, take a black sweater with white small dots and mix it with black skinny pants, a black leather jacket, black patent leather ankle boots and a black and white leather bag. Or choose white skinny cuffed pants and pair them with a black button down shirt, a beige and black polka dot sweater over a shirt and leopard ankle strap high heels. Wanna something eye-catching? 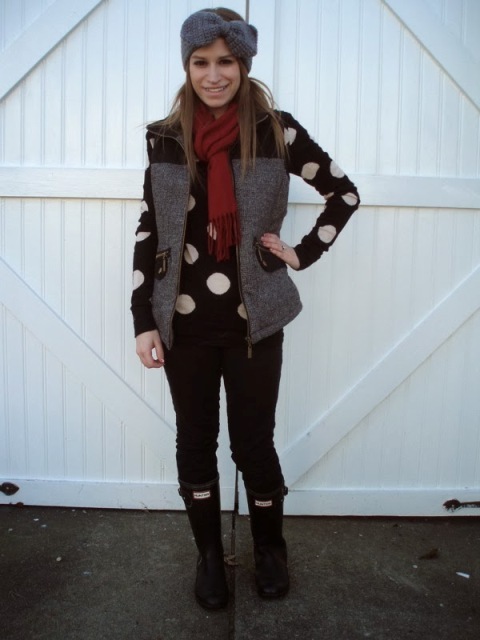 Then combine a teal and white oversized polka dot sweater with black culottes and black leather cutout flat ankle boots. Or mix two prints in one outfit: try to repeat a combination with a white shirt, a gray and white polka dot sweater, jeans, pale pink flats, a plaid mini coat and a black tote. If you want to create a romantic and flirty outfit, then take a black and white sweater and combine it with a pale pink pleated midi skirt, beige pumps and a beige leather chain strap bag. 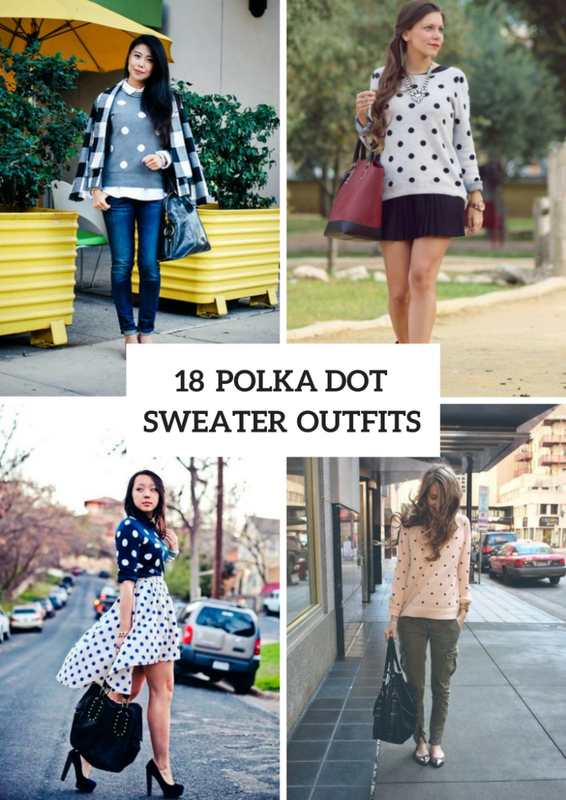 Or choose a navy blue sweater with white dots and mix it with a polka dot high-waisted skirt, black high heels and a black tote. 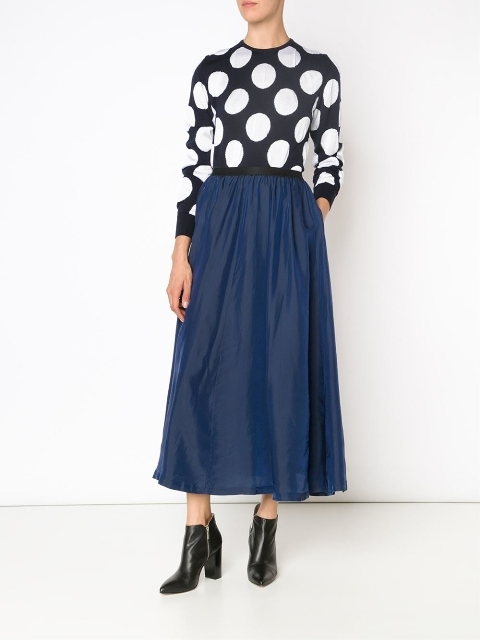 For a more casual look you can pair a sweater with big dots with a navy blue maxi skirt and black ankle boots.